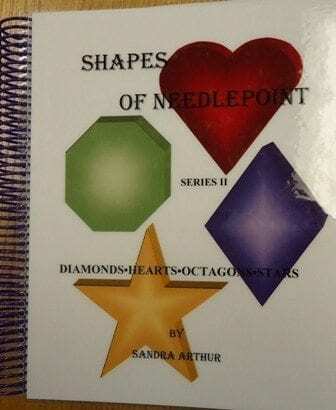 This book features Diamonds, Hearts, Octagons and Stars. I don’t know about you, but sometimes I think stars can be a real pain. You want them to be fun and perfect but you’re tired of your same old tried and true stitches. This book has some pretty good ideas for stars and hearts. I don’t stitch a lot of stop signs (octagons) but if I did a lot of designing myself, I can see that this would be a handy reference. The diamond shapes are great too. I can see using these as a filler, a border, or even in some larger painted areas. 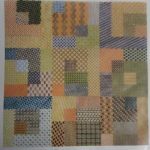 Like her last book, these are indexed both as shapes and by the size of the canvas threads they cover. HANDY! Spiral bound (in purple so as not to be mixed up with #1 in red), 117 pages with Super Large graphs, you’re sure to want this in your library at $44.95. Also check out her Series I book on Circles, Squares, Triangles, Rectangles ($34.95) in case you want to get them both together. 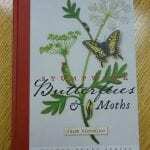 SKU: 67ea9500b6ab Categories: Books, Charts, CDs, Magazines, NEW NEW NEW, SALE!